Our quality is of the highest calibre, we have been in the stone industry for over 30 years. Our work quality is backed up by our workmanship warranty, and we only use the best products that have been tested and proven time and time again. We only use Australians and Italian glue to fabricate and install. All stone products we fabricate have official certification and accreditation. We provide a full service, and in-house measure and quote. Our staff are easy to deal with, and they have high respect all our customers. We offer aftercare service, repairs (chips, scratches), re-sealing, proving aftercare products of highest quality. Customers have been commending us on our aftercare service and problem-solving abilities. If one of our customers has issues with our recently installed stone, we make sure to handle it with ease as fast as possible - no gimmick, no hassled, no fuss. We offer longer warranties on all projects we completed. This includes lamination of stone; all mitre joins, surface joins, under mount sinks and installations. 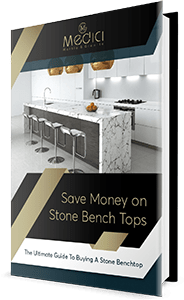 Most stones come with a 10+ year warranty from the stone supplier, and because we are producing jobs that are of highest quality, we backed all our works with up to 5-year warranty. Our customers get the best value for their money at Medici because we make sure that they are using most efficient materials. We offer the best stone options that may be on special, and we use factory stock, competitive prices, without comprising the quality.